Cabinet enclosed electric vaporizer at a public school. Pre-packaged, medium sized direct-fired vaporizer. 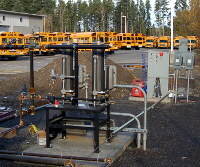 Horizontal waterbath vaporizers supply a coal power plant with vaporized propane. 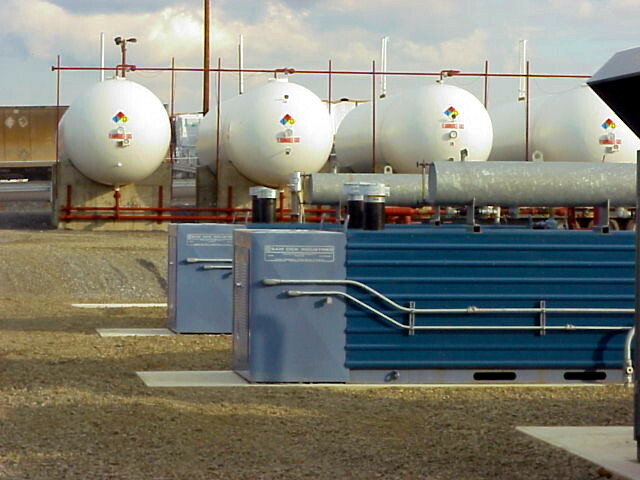 Some small propane loads can be supplied with vapor drawn directly off the top of a tank. Heat is conducted from outside the tank to the propane liquid at a rate sufficient to support the required vaporization. 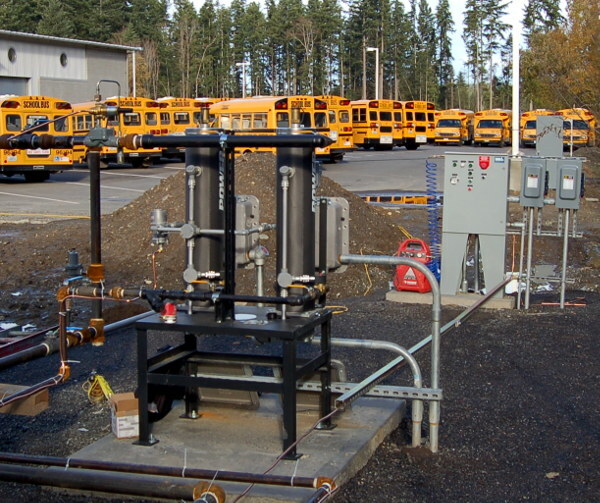 In the process, a gallon of liquid propane will become approximately 36 cubic feet of vapor. For industrial and larger commercial loads, this simple approach to vaporization has limited application. Instead, "vaporizers" are used to heat the liquid LPG, creating the needed volume of vaporized gas. Vaporizers are available in sizes from ten gallons per hour to thousands of gallons per hour and use a variety of methods that impact several aspects of overall system design. Vaporizers add sensible heat to bring the liquid to the boiling point, latent heat to change the phase of the LPG from liquid to gas, and superheat to allow some handling of the gas without re-condensation. 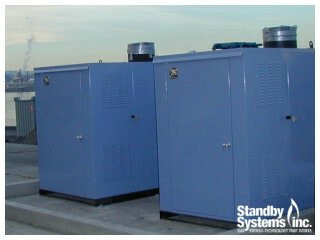 Security - Our cabinets are constructed from rugged steel sheet metal and feature locking handles to keep intruders out. Longevity - Housing a vaporizer in a cabinet protects it from constant wear and tear from sun and weather. The protection provided by a cabinet can extend the life of a vaporizer many times over. 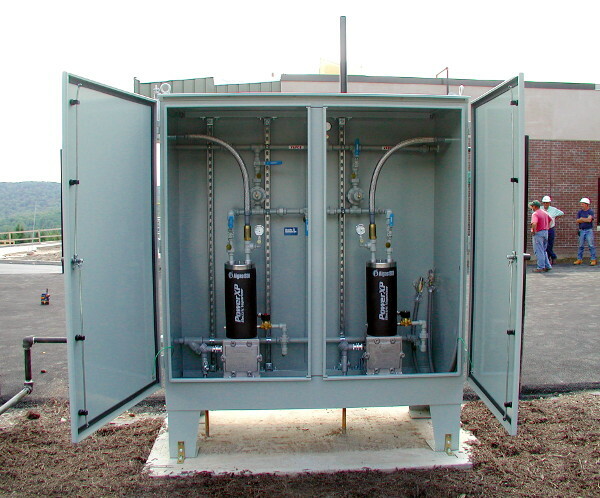 Aesthetics - Surrounding pipe and components with a painted or stainless steel enclosure makes your system more appealing with a clean and professional appearance. Enclosures are available for electric vaporizers only. A vaporizer in which heat from a flame directly comes in contact with a heat exchange surface in contact with the liquid LPG to be vaporized. In most cases the flame source is from the vaporized LPG itself and vaporizers with a capacity of less than 120 gph operate without the need for external utility connections. Beyond this range, an electrical power source is generally required for the burner control system. The fact that an open flame is located at the vaporizer results in restrictions in the location of these vaporizers within a LPG facility. Simple to install, no electricity required. Complete with all operating and safety controls. 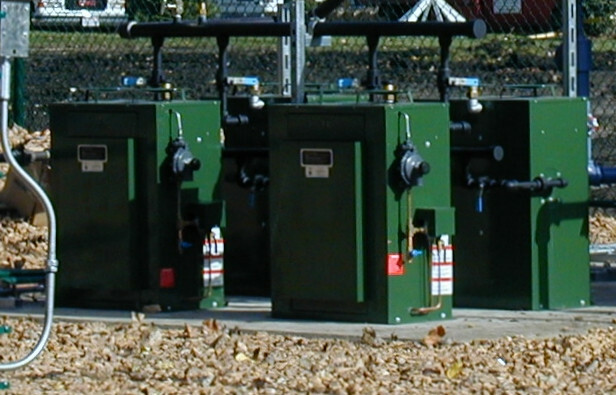 Offers uniform gas supply over a broad temperature range. Only requires 1.5 square feet and two connections to install these self-contained units. Indirect vaporizers have two meanings within the industry. As opposed to a direct fired vaporizer where a flame directly impacts the LPG heat exchanger, an indirect vaporizer heats an intermediate substance, which in turn heats and boils the LPG. Thus the vaporization is indirect in this sense. Examples as followed. Safe and efficient LPG vaporization means for commercial, industrial and utility gas consumption applications. Vertical design with a single pass tube coil surrounded by a waterbath which is heated by LPG or natural gas fired power burner. Optional IRI, CGA burner configuration. Horizontal design in which an LPG or natural gas fired power burner heats a waterbath containing an immersed multiple pass heat exchanger. Temperature controller regulates the on\off cycle of the burner to maintain the waterbath temperature at a predetermined point. Waterbath circulating pumps promote heat exchanger efficiency. Electrical heating elements are cast into a solid metal core (generally aluminum) which is then used to heat the LPG. In some cases the solid core is directly in contact with the LPG and in others the LPG heat exchanger has also been cast into the core. Solid core vaporizers have a much higher pressure rating than other electric vaporizers, making them an ideal choice for specialty applications. However, if the heat source is located at the point of vaporization, and is capable of igniting flammable gas mixtures that may be present, then the rules governing location of the vaporizer within a facility are those of a direct fired vaporizer. The latest innovation in LPG vaporizers. Simple design, reliable performance, affordable price. No switches, thermostats, floats, or relays. Small, explosion-proof, light-weight, and wall-mountable. No corrosion, no water to monitor or replace. 1.82 MMBtu/hr, 20 GPH, 40 kg/hr, 0.448 million kcal/hr. Works with any propane/butane LPG mixture and operates at temperatures down to -40F./-40C. Hazardous area classification - Class I, Division 1, and Zone 1. 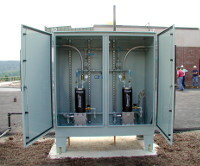 Heater cores are linked in a parallel system to provide large vaporization capacity within an integrated, compact system. Common liquid and vapor manifold provides link for heater core. 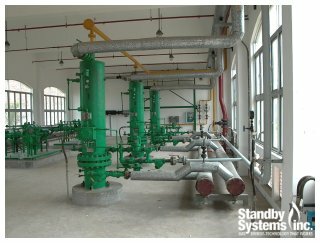 Independent operation and safety controls provided for each core; isolation valves permit segregation of individual units. Units provide 100% turndown capability and can be maintained in the ready mode. Steam and hot water vaporizers use heated water or water vapor to vaporize liquid gas. The heated water is passed over the vaporizer's heat exchangers where it is then transferred to the liquid gas. This process is called "indirect" heating. Steam and hot water are simple and reliable methods for vaporization. Indirect heating is simple and reliable. Liquid LPG enters the vaporizer shell and vaporizes upon contact with the heat exchanger bundle.